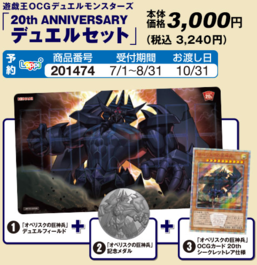 20th Anniversary Duel Set is a set that can be reserved from July 1 to August 31, 2018 using the Lawson's Loppi system. The Duel Set will be delivered on October 31, 2018. 1 20th Secret Rare "Obelisk the Tormentor"
This page was last edited on 1 November 2018, at 03:05.